Rich Carperter with Din! They earned the seasoned title by passing 2 started tests and 3 seasoned tests. 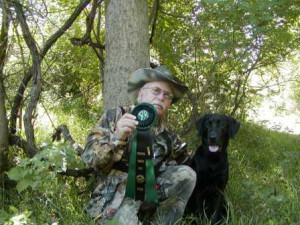 This hunt test is for Seasoned Hunting Retrievers and Handlers. It duplicates actual hunting conditions throughout your area. Judges will look for style and natural ability and evidence that the Seasoned Hunting Retriever exhibits a reasonable degree of control. These hunting tests have longer retrieves on both water and land than Started Tests. 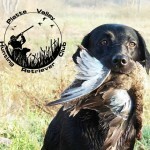 The Seasoned Hunting Retriever in these hunting tests usually has a couple of seasons of hunting experience, and the Handlers have spent more time training. Seasoned dogs must be steady and must deliver to hand. Dogs are brought to and from the line on lead. The handler must handle the shotgun and track the bird and fire poppers at the bird at the top of the arc. Gun safety is critical! Unsafe handling fails the handler and dog with no chance to run rest of the test that day. If you are not familiar with the gun, ask for a review before the test or at the line. Better safe than sorry (and flunked). Pumps are the most likely used gun. Only official guns may be used. See the test marshal if you need a special gun — usually arrangements can be made for them to let you use your gun. Double marks will be expected and the dog needs to expect a diversion on the return from a mark. A walk-up test is almost certain. A quartering or tracking test could be seen, though its not likely. Switching does not fail the dog, but it is penalized. Your dog needs to be able to do a short blind (60 yards) in both land and water. Maximum distances for marks is 100 yards on land and 75 yards in the water. There is no honor required in Seasoned.